For decades people have been baffled by the ugly brown damage in the gold edge of Frances Williams. The mystery was solved a couple years ago when Carol happened to be out taking pictures of hostas after a rain on a cool early spring day. We saw that some leaves on Linda Sue had spots that looked like they were saturated with water, but didn't think anything of it at the time other than that it was odd. Later we noticed that the brown spots had developed and when we checked the earlier pictures we saw that the water-soaked spots were in the same places. It turned out that the Frances Williams mystery spots were caused by edema - a water buildup in the leaves when they were still soft and developing. Leaves become so full of water in spots that cells burst and die, leaving dead areas. Light damage can look like sandpaper was used on the leaf, while heavy damage leaves completely dead spots. Fortunately very few varieties have trouble with edema, probably due to some genetic weakness in the cell walls. It only happens in early spring when the leaves haven't hardened off yet. Damaging edema occurs in Frances Williams and its sports, Emerald Ruff Cut, and a handful of other hostas on cold wet spring days before the leaves have hardened off, but may take a couple weeks to become apparent. In the Garden: There isn't much that can be done as it is weather-related. 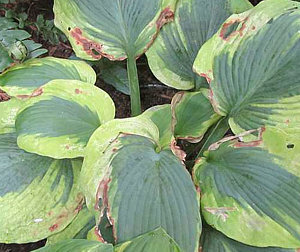 Only a small number of hosta cultivars are affected. In the Nursery: Keep stock of hostas known to be affected under cover with minimal water until they are hardened off and the weather has warmed.